My brother Tony is a gastroenterologist. He spends his weekdays at the ultra-modern Asian Hospital examining people's intestines and stomach linings with a special camera called the endoscope. However, his weekends are spent looking through another camera – his Nikon D80. Just last week, I found out that his photographs are among the most popular in the Flicker community. Each pretty picture elicits up to 140 comments from viewers and admirers all over the globe! His favorite subject? 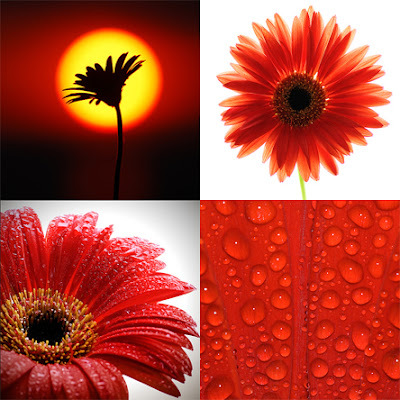 Gerberas – one of the five most bought flowers in the world. Below are four of my favorite photographs from his collection. Top left: The classic Marimekko flower appears on this Be@rbrick produced by Marimekko, the leading textile, fashion, accessories and home furnishings company in Finland. Created by Maija and Kristina Isola, this vintage 60s poppy pattern (called the Unikko) is still featured on many of Marimekko's products today. 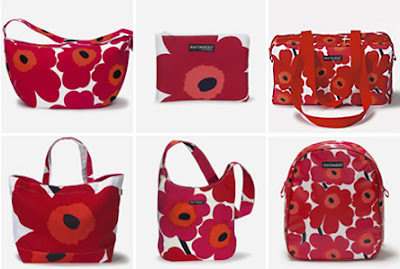 Check out Marimekko's latest bag collection below. I have this 100% Marimekko bearbrick with the tray last year, they are a set of two and I love it so much as I sometimes would visit the Marimekko shop in Oslo as well. And your brother's photo in flickr is impressive as well! Yes, LittleOslo, I have the other Marimekko Bearbrick, too! One day I will also write about it. I'm glad that people from Oslo are reading my blog. :-) Thanks, I will tell my brother what you said. Your brother's photos are awesome! I love the one with the water droplets! A small world indeed. I've been an admirer of Doctony's photography for quite some time. I can see creative artistry runs in the family. Is it just me, or are these be@rbricks getting cuter and cuter every time you post? The Marimekko bears are so sweet. I love the panda and the watermelon be@rbricks too. Can you point me in the direction of any Canadian themed Be@rbricks? This is the Series 10 Canadian Flag Bearbrick available on the Net. Your brother's photos are beautiful, luminescent. Does he ever sell printed/framed copies?